A regular savings plan (RSP) can potentially outperform a lump sum investment in volatile markets. 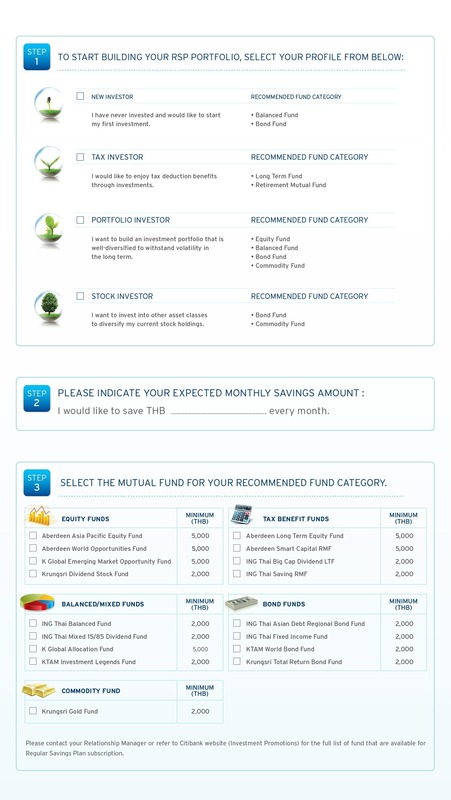 Regular Saving Plan is a disciplined way of saving through regulary investing an equal amount of money to even out the ups and downs of the market and average down the unit cost of your investment. Thus, you will find that RSP can help you achieve your financial goals. What is a Citi Regular Savings Plan (RSP)? The Citi RSP is a plan which invests a fixed amount of money into the mutual fund of your choice, on a fixed monthly basis. For your peace of mind. Automated monthly investment to meet your long term financial goal. Manage market timing and remove the emotional factor from your investment decision. Regular and disciplined investment can allow you to capitalize on market opportunities whenever they arise. Saving on a monthly basis will help you to reap the benefits of Dollar Cost Averaging. The following scenarios illustrate the concept of Dollar Cost Averaging. Citibank Fund Risk Rating is according to Citi's standard and SEC's guidelines. Fund Risk Rating between Citibank and Fund House can be different. Investment contains certain risk, please study prospectus before investing. Not an obligation of, or guaranteed by, Citibank. Not bank deposits. Subject to investment risks, including possible loss of the principal amount invested. Subject to price fluctuation. Past performance does not guarantee future performance. Not offered to US persons.